Tallness takes beauty to another level. Lucky are those who are tall naturally. For a short person intending to look tall, stilettos is an easy option. Every woman's wardrobe is incomplete without stilettos. Apart from making you look tall, stilettos are an evergreen style statement. The slope of your high heels forces you to balance on the balls of your feet, thereby tensing your calf muscles, shortening your hamstrings and protruding your rear slightly outward, giving you a more toned look. But how safe is it to wear one regularly? • Foot pain is one of the most common side effects of wearing high heels. Since the entire weight of the body concentrates on the feet, hip and foot pain is common. • The inappropriate position of the ankle sends jolts of pain through the calf muscles and over to the hip causing hip pain. • If it is a stiletto shoes, then because of the body weight, the foot would be pushed into unnaturally narrow tip at the front of the shoes. This increases the friction between your skin and the shoe leather which causes blisters and even ingrowth of toenails. • Because you would be forcing your weight on the 3inch spike along with a disrupted posture, you would be putting seven times more pressure on the balls of your feet that may sprain or break your ankle. • Wearing high heels puts pressure on the lower back thus causing throbbing pain in the lower back. • The concentrated weight of your body on the heels might make them hard and cause yellow patches. It may also deform or misshapen your feet. 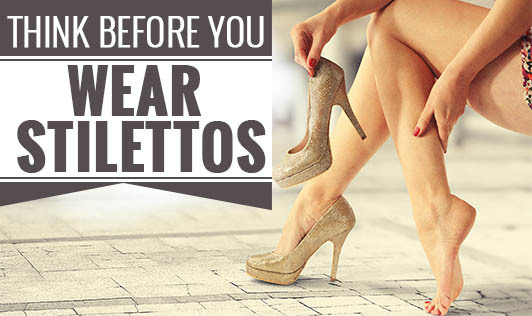 Stilettos might make your body look more toned and make you more stylish but make sure you give it a serious thought before you plan to wear or buy stilettos.